MM (Deemed to be University), Mullana celebrated its Annual Convocation Day on Thursday, 14 June 2018. Swami Chidanand Saraswati Ji, President and Spiritual Head of Parmarth Niketan Ashram, Rishikesh, was the chief guest of the ceremony and the event was presided over by honourable Chancellor Mr Tarsem Kumar Garg. Swami Chidanand Ji had addressed students with his great experiences and words of wisdom. He honoured toppers and gold medallists of various MMDU academic programs. The university, at the event, awarded degrees and diplomas to more than 2000 students from India as well as other countries. PhD holders along with their degrees also received a plant to encourage the Go Green mission. 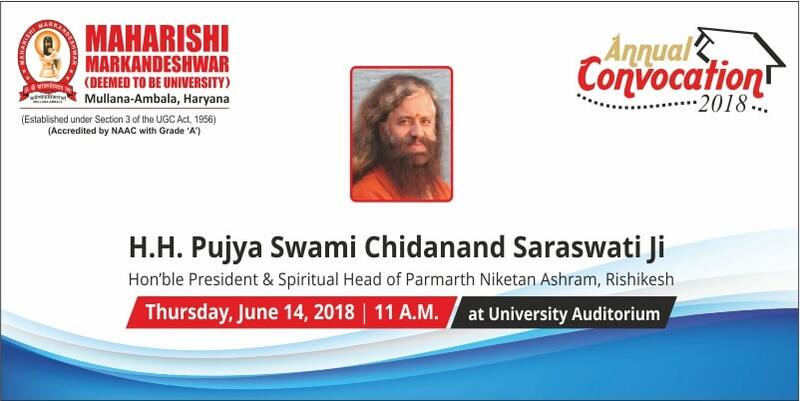 Motivating the huge gathering of graduating students, Swami Chidanand Ji highlighted the importance of good institution, silence, and goodwill. His final address entreated the graduates with a saying, “Life is to learn and to learn means not to have more”. Continuing he said, “Succeeding in one way is not a success”. That is why “Life is not to have more, life is to be more and to be more is share more, give more and care more”. Another speaker of the day, Honourable Vice-Chancellor Dr, Victor Gambhir addressed the esteemed gathering and explained various things about Maharishi Markandeshwar (Deemed to be University), Mullana. On the convocation day, students and faculties had witnessed an exceptional sight of International veracity at its best when Indian students received their degrees and diplomas along with the students from other countries. The preparation of the ceremony was magnificent. During the event, both faculty and students were on their toes to make the convocation day event a grand success. To mark the event, an enthralling cultural program was also presented by the students of various streams of the University. The annual convocation day event was followed by Alumni meet where Alumni’s interacted with the current batch of the students as well as faculty. The venue was filled with graduates and their friends cheering on their success. It was certainly a very special event for everyone involved! MMDU Annual Convocation Day was organised to award degrees to the students from various fields like Medical, Engineering, Computer Applications, Nursing, Business Management, Hotel Management, Pharmacy, Law, Dental, Physiotherapy, and then some. On the Convocation Day, 93 students were awarded with Doctoral Degree, 591 students with Masters Degree, and around 1568 students with Bachelors Degree.